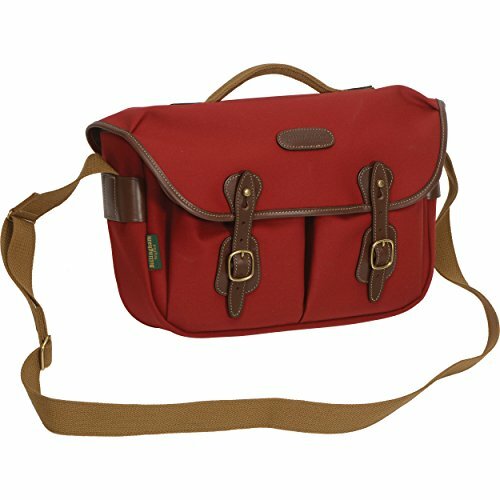 The burgundy canvas & chocolate leather trim Hadley Pro Special Edition Shoulder Bag from Billingham holds a DSLR with an attached lens, a lens such as a 70-200mm f/2.8, and a flash between padded, touch-fastened dividers within a removable camera insert. For accessories, the bag features dual expandable slip pockets at the front, and a rear zippered pocket at the back. The top front of the bag features Billingham's classic rain flap, which is secured by front hand-finished leather straps with brass detail. You can carry the bag using the adjustable shoulder strap with a comfort pad, or by using the top grip handle.